MacBook lets you do some fun stuff with the Desktop & Screen Saver Pane. Hey, no offense to the awesome Mountain Lion background, but who doesn’t want to choose his or her own background? And what about that nifty screen saver you just downloaded from the Apple website? 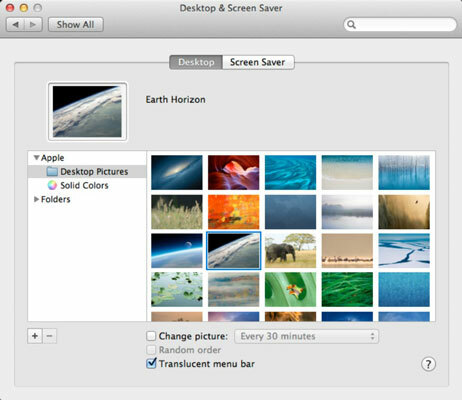 You can change both your background and your screen saver by using these options in the Desktop & Screen Saver pane. To display a different image collection or open a folder of your own images, click the Add Folder (plus sign) button at the lower left of the window and browse for your heart’s desire; then click Choose to select a folder and display the images it contains. Layout: You can tile your background image, center it, fill the screen with it, and stretch it to fill the screen. (Note that filling the screen may distort the image.) The layout pop-up menu appears only when you’re using your own pictures, so you won’t see it if you’re using a desktop image supplied by Apple. Change Picture: Change the desktop background automatically after the delay period that you set, including each time you log in and each time your Mac wakes up from sleep mode. Random Order: To display screens randomly, enable the Random Order check box. Otherwise, the backgrounds are displayed in the sequence in which they appear in the thumbnail list. Translucent Menu Bar: When enabled, this feature makes your Finder and application menu bars semi-opaque, allowing them to blend in somewhat with your desktop background. If you’d rather have a solid-color menu bar, deselect this check box. Screen Savers: In the Screen Savers list at the left, click any screen saver to preview. To try out the screen saver in full-screen mode, click the Test button. If the screen saver module that you select has any configurable settings, click the Screen Saver Options button to display them. Choose the Random screen saver to display a different screen saver module each time the screen saver is activated. Start After: Specify the period of inactivity that triggers the screen saver. To disable the screen saver, choose the Never setting at the top of the list. Show with Clock: If you want your selected screen saver to display the time as well, select this check box. Hot Corners: Click any of the four pop-up menus at the four corners of the screen to specify that corner as an activation hot corner or as a disabling hot corner. As long as the cursor stays in the disabling hot corner, the screen saver doesn’t kick in. Note that you can also set the Sleep, Mission Control, Launchpad, Notification Center, and Dashboard activation corners from here. For additional security, check out the Security & Privacy pane in System Preferences, where you find the Require Password After Sleep or Screen Saver Begins check box. Select the check box, and Mountain Lion requires your user account password before allowing anyone to turn off the screen saver (a great idea when traveling, as you can imagine).